Love running? Here at Fit Armadillo we definitely do! Most of our online personal trainers and certified fitness professionals are runners - some are casual runners and others? They are seriously fast! You might find them on a podium the next time you run a race (check out Megan HERE)! On the blog you'll find some of our favorite running routes as well as running tips that cover everything from how to start a running routine to yoga for runners to more detailed training plans for runners. We're even hosting our 1st Virtual Fun Run to raise money for our favorite non-profit, Girls on the Run! Whether it's from personal experience or working with our fitness clients, we know that runners often skip cross training. While cross training might not seem as cool as running, it is definitely important and it can be fun! Especially, if you use equipment like a stability ball (also known as a Swiss ball or exercise ball) to add in some functional, core strengthening moves. Sound cool, but don't know where to start? Pilates instructor, Harjit, our certified fitness professional of the month for November 2017, has stopped by to share three Pilates exercises you can incorporate into your routine as a runner. 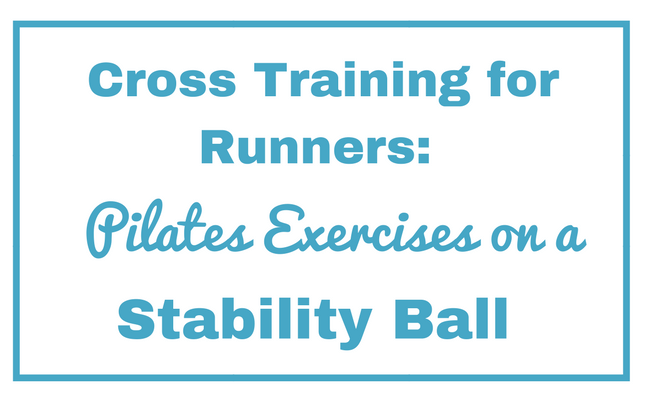 Why Try Pilates for Cross Training as a Runner? Harjit shares, "Whatever your running goals and starting point, Pilates can be your secret weapon! You'll have better running form, a quicker recovery and protection from injuries. Many of my local clients have stability balls at home but prefer coming to class. It gives them accountability, motivation to work harder and confidence that they're doing the moves correctly. They finish the class feeling energized, taller and toned from the inside out!" Check out the video to learn three Pilates exercises you can complete on a stability ball that will help you as a runner. Now that you've watched the video, it's time to take action! If you didn't follow along while watching this workout, schedule a time to watch it and add some cross training into your routine! When you do? We'd love to hear your thoughts! Share them in the comments below. Need a stability ball? You can often find them at most sporting goods stores and they are often fairly inexpensive at Marshalls and TJ Maxx. An online option with good reviews is THIS one. Want to enjoy a private Pilates session? Whether you want more accountability, help checking your form, or a routine tailored to your needs, you'll love working with Harjit! Head to her booking calendar HERE.